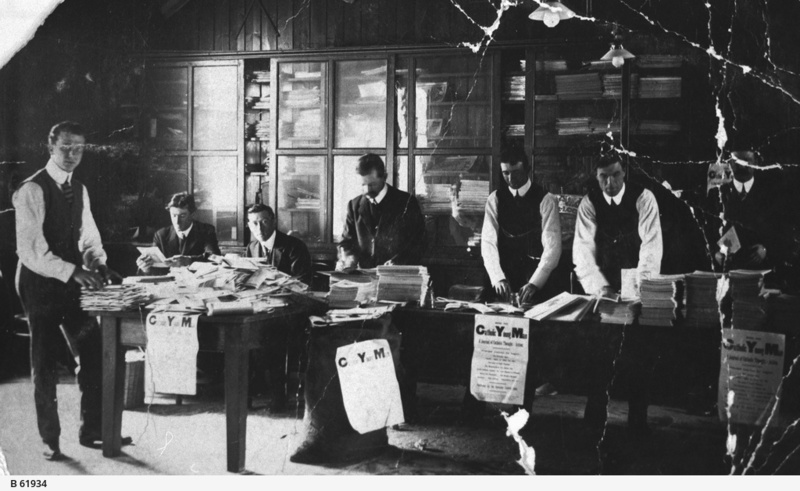 GENERAL: Workers in the Adelaide office of the Catholic Young Men's Paper. Left to right: Gaetano Rubeo; John Patrick Hanson, who owned a book shop in Adelaide Arcade for 20 years; Eddie McCarron, who owned the Red Lion Hotel; C.J. Dennis, well known South Australian writer and journalist; Mr Madigan, who worked for John Martins; Frank Hansen thought to be a Port Adelaide football team captain who lived to the age of 96; Mr. Cahill, far right and obscured.